The next time you're presiding over an intense philosophical debate, feel free to use these hand signals to referee things. 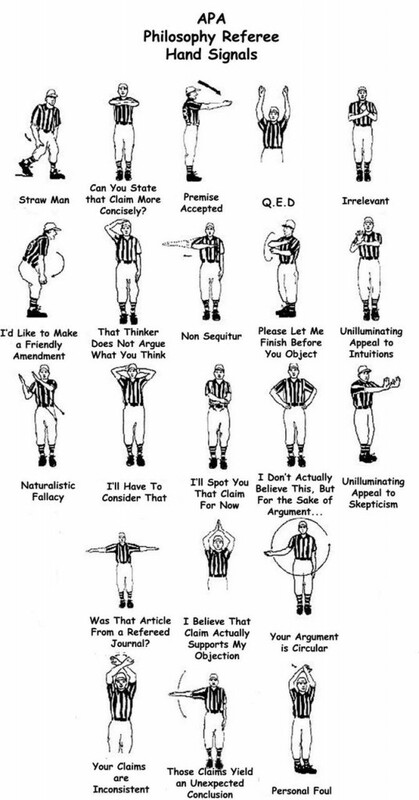 Devised by philosophy prof Landon Schurtz, these hand signals were jokingly meant to be used at APA (American Philosophy Association) conferences. Personally, I think they would have made a great addition to the famous Monty Python soccer match where the Germans (Kant, Nietzsche & Marx) played the indomitable Ancient Greeks (Aristotle, Plato & Archimedes). Imagine Confucius, the referee, whirling his hand in a circle and penalizing Wittgenstein for making a circular argument. Priceless. Click on the URL at the top of the browser, copy it (ctrl-c or cmd-c), and paste it in an email. Thank you so much! I actually sent this on to my sons as one is working on his Masters in Philosophy and the other one is a Classics major. The Monty Python soccer match is one of our favorites, too! I’m going to have to break these up into individual diagrams so I can tweet them to people! Those hand signals make the obtuse world from Socrates to Marx , Confucius to Kant a bit accessible to the common men who are otherwise mortally afraid of to walk the terrain.